Certain heritage breeds, in my opinion, taste better but they also taste different from much chicken eaten.The customer is the ultimate arbiter. Currently, the more familiar bird is the pastured chicken we have chosen. If this changes we will consider to other breeds. Our mainstay meat bird is the red chicken. These are slower growing than the Cornish Cross. The reason for this is customer acceptance for the taste. Red Broilers are more active than Cornish Cross and grow more slowly. They rarely experience leg weakness or Ascite (which is fluid in the body cavity). Red Broilers are better insect foragers. Rest assured we treat the birds well and don’t let them get too top heavy. On occasions we have had Cornish Cross birds but we slow their growth by controlling access to food to prevent them out greowing themselves. 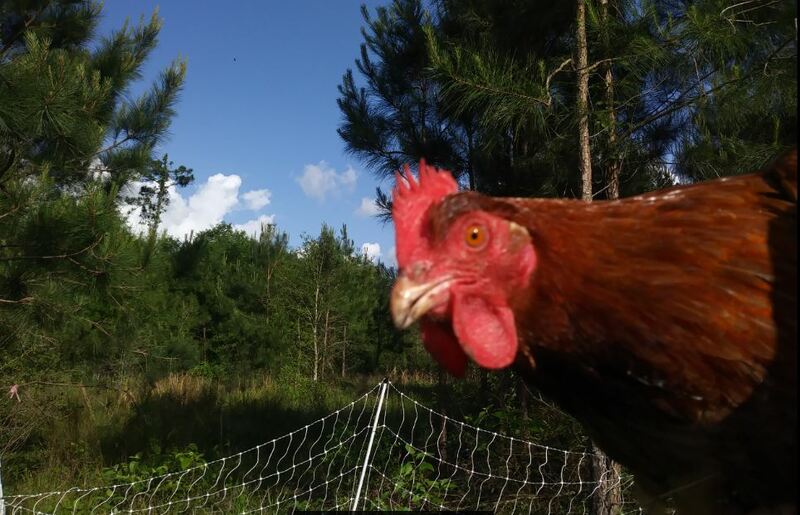 The chicken is pasture raised and fed on non-GMO and organic feed to supplement their diet. The birds are given regular access to electro mesh fenced paddock that advances as the chicken tractor advances. They are given organic pro-biotics in their water to help maintain their digestive health. They have never received antibiotics or hormones. Whilst they get good nutrition from pasture, they do need feed supplementation. We use Texas Naturals feed. Their feed is primarily Sorghum, peanut meal, oats and brewers yeast – NOT corn. It also contains no soy or GMO materials. We never add corn to the feed we give our birds. Our birds are hand processed at a Texas State inspected facility, where they are treated with respect due to all animals. After processing they are air hung over night and vacuum packed to keep in the flavor. We sell at two Houston farmers markets.